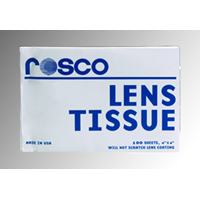 Rosco 4" x 6" Lens Cleaning Tissue. Soft, lint free, absorbent tissue for cleaning precision optical surfaces. This product contains no silicones or chemical additives and exceeds federal specifications. It assures safety for coated lenses. Click here to view the Rosco Canada web site.